Bhatta Parsaul was once a quiet farming village but now, as it finds itself at the centre of a major political row, it is strewn with mounds of ash, burnt-out motorcycles, tractors and cars. In early May villagers here clashed with armed police who tried to break up a four-month-old sit-in protest at the village. They had been fighting the terms of the acquisition of their farmland in the Greater Noida area near the Indian capital, Delhi, by the Uttar Pradesh state government. In the violence, two policemen and two villagers were killed as parts of the village were set alight. But on Monday, after a dramatic pre-dawn visit to the village, Congress MP Rahul Gandhi claimed that many more farmers had been killed by police and their burnt bodies were left in heaps of ash. He also claimed that women had been raped. This has now escalated into a political war between the Congress party and the state's governing Bahujan Samaj Party. But what does the evidence from the village suggest? Nearly two weeks after the original clash, villagers still recall the severity of police action with anger and a sense of helplessness. Many women in the village recounted how they were beaten mercilessly, but not a single woman the BBC spoke to alleged they had been raped or sexually molested. "The policemen beat my mother and when my sisters and I tried to save her, they hit us badly and fractured my arm," says Neha, a 16-year-old schoolgirl with a bandaged arm. Jag Roshni, a woman in her eighties, said that policemen forcibly entered her house and took away a gold chain and some cash: "They used filthy language and abused women and hit us." Sri Pal, 45, claims the police did not spare anyone: "Women, young girls, children, old and infirm men were all beaten by them." Sri Pal's brother, Rajpal, was among the two villagers allegedly killed by police gunfire. He says the police did not let them take Rajpal's body to the village. On the evening of 7 May, armed policemen surrounded the village and started setting farmers' properties on fire in the presence of journalists. I was there at the time and journalists were stopped on the outskirts of the village and when some of them tried to enter the village, their cars were smashed and they were forced to return. Hundreds of farmers fled the village to escape the police. State authorities later said two policemen and two farmers were killed in the clashes. They say that farmers fired at police and killed two of them. So far there is little hard evidence to support Rahul Gandhi's claim that bodies were in the heaps of ash. I tried to examine the mounds of ash and all I found were melted objects which had solidified after the fire was doused. Without forensic laboratory expertise, they are difficult to identify. On the face of it, they do not appear to be human bones. People in the village are reluctant to say anything. Despite the rumours that many are dead, nobody has done a headcount. But hundreds of farmers in Bhatta Parsaul are still missing. Villagers say they are too scared of police reprisals to return. Sri Pal also says it is difficult to ascertain the number of people killed because many farmers from neighbouring villages were also protesting on the day of the police firing. Farmers from at least 10 villages had gathered to participate. The Congress party has now tried to play down Mr Gandhi's claims and blamed the media for "misrepresenting" facts. A spokesman told reporters that Mr Gandhi never claimed that 74 bodies were interred in the ash, as was widely reported, but that there was a 70-foot-wide mound of ashes. 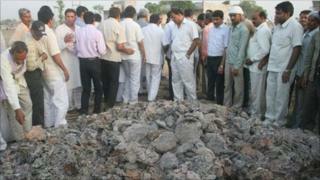 But Rahul Gandhi categorically stated there were bodies present in the heaps of ashes. The party said the claim was based on the statements given to Mr Gandhi by the affected villagers. An all-out war of words has broken out between the Congress party and the Bahujan Samaj Party, which is in power in Uttar Pradesh. Bhatta Parsaul is just the latest epicentre of India's land wars which have brought into focus a controversial land acquisition law, enacted by the British in the 19th Century. The law enables government to acquire private land for "public purpose". Farmers in other states have also been opposing land acquisition and have clashed with police in the past. The government says it needs land to develop infrastructure and mining activities to fuel India's fast-growing economy. The government in Uttar Pradesh has acquired thousands of hectares of land along the Yamuna river to build a super highway to link Greater Noida with Agra, known for the famous Taj Mahal. Villagers say the government paid them very little compensation but sold the acquired land to private builders at a much higher price. Pali, an 80-year old farmer, told the BBC that his land had been acquired and he received the equivalent of about $200,000 as compensation. "The government is selling our land to private builders at six to 10 times higher rates," says Pali. However, Uttar Pradesh's Chief Minister, Ms Mayawati, has said that land acquisition is not an issue in Uttar Pradesh. She has rejected all allegations of police brutality, accusing opposition parties of fomenting trouble to "reap political capital" in the state where legislative elections are due next year.